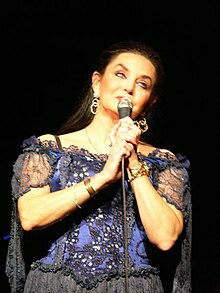 Crystal Gayle (born Brenda Gail Webb; January 9, 1951) is an American country music singer. Best known for her 1977 country-pop crossover hit song, "Don't It Make My Brown Eyes Blue", she had 20 number-one country hits during the 1970s and 1980s (18 on Billboard and 2 on Cashbox) and six albums certified gold by the Recording Industry Association of America. Gayle became the first female artist in country music history to reach platinum sales, with her 1977 album We Must Believe in Magic. Also noted for her nearly floor-length hair, she was voted one of the 50 most beautiful people in the world by People magazine in 1983. She is the younger sister of the country singer-songwriter Loretta Lynn and the singer Peggy Sue and a distant cousin of singer Patty Loveless. Gayle has a star on the Hollywood Walk of Fame, near Lynn's star. Crystal Gayle was born Brenda Gail Webb on January 9, 1951, in Paintsville, Kentucky, to Clara Marie "Clary" (née Ramey; May 5, 1912 – November 24, 1981) and Melvin Theodore "Ted" Webb (October 24, 1906 – February 23, 1959), a coal miner. Webb's family moved north to Wabash, Indiana, when she was four. Four years later, her father died of black lung disease. Though a shy child, Brenda would sing along with country and pop songs on the radio, and she was encouraged by her mother to sing for visitors to their house. Inspired by the success of her sister Loretta Lynn, she learned to play the guitar and sing backup in her brothers' folk band. While still in high school, she began to tour with her sister for a few weeks each summer. After graduating from Wabash High School in 1970, Brenda signed with Decca Records, her sister's label. However, since there was already a singer named Brenda Lee with Decca Records, she was asked to change her first name. Loretta Lynn suggested the name "Crystal" after seeing a sign for the Krystal hamburger restaurant chain. Brenda Gail Webb thus became Crystal Gayle. In 1971 she married Bill Gatzimos, her high-school sweetheart; they have two children and a grandson. Gayle's debut single, "I've Cried (The Blue Right Out of My Eyes)", was released in 1970 and peaked at number 23 on Billboard's country singles chart. Written by Loretta Lynn, it was performed in a style similar to that of her sister. Decca asked for more records like Lynn's, who wrote more of her early singles. This approach failed to establish Gayle, despite regular appearances on Blake Emmons's television show The Country Place. She did not reappear in the country Top 40 until the 1974 release of "Restless", which reached number 39. Frustrated, she left Decca and signed with United Artists, where she teamed with the producer Allen Reynolds, who offered her the creative freedom she wanted and helped her develop her own style and phrasing. The first album, Crystal Gayle, was released in 1974 and produced her first top-ten country hit, "Wrong Road Again" (number 6). By 1976, she had the first of her 20 number one country singles with "I'll Get Over You", which also became her first single on Billboard's Hot 100 (number 71) and adult contemporary chart (number 40). The following year, she had two more top-2 country hits, "You Never Miss a Real Good Thing (Till He Says Goodbye)" (number 1) and "I'll Do It All Over Again" (number 2), before achieving her greatest success. Gayle recalled what her sister Loretta Lynn had said: "'You record what I couldn't record — you do MOR, middle of the road', "and that was the best advice I could get. I don't think I ever would have made it if I went down the road and did the music my sister did. I would only have been compared to her." Believing Gayle was poised for a larger breakthrough, Reynolds encouraged her to record the jazz-flavored ballad, "Don't It Make My Brown Eyes Blue". The song became the most successful of Gayle's career, spending four weeks atop the country chart. The song reached Number 1 on the Cashbox Top 100 Singles pop chart, became her biggest hit on the Billboard Hot 100 (No. 2), peaked at No. 4 AC and gained considerable airplay worldwide. Gayle earned a Grammy Award for Best Female Country Vocal Performance and the song also earned a Grammy as Country Song of the Year for its writer, Richard Leigh. The song helped her album, We Must Believe in Magic, become the first by a female country artist to be certified platinum. She toured worldwide, including Britain with Kenny Rogers and China with Bob Hope, where she became the first person to record a performance on the Great Wall of China. After the success of "Don't It Make My Brown Eyes Blue", Gayle and her record producers leaned more toward crossover music with each new release. For the next ten years, she would have her greatest success. Gayle was awarded "Female Vocalist of the Year" for two years by the Country Music Association Awards (1977 and 1978) and for three years by the Academy of Country Music (1976–1977 and 1979). Gayle remade a track previously recorded track for her album Crystal, "Ready for the Times to Get Better", as her first single after "Don't It Make My Brown Eyes Blue". Although the single became her fourth number-one Country hit, it failed to reach the Pop Top 40 (number 52). Gayle's next album, When I Dream, yielded three Top 3 Country hits – the No. 1 songs "Talking in Your Sleep" and "Why Have You Left the One You Left Me For" as well as the number 3 title track. "Talking In Your Sleep" returned Gayle to the pop Top 20 (number 18). Gayle left United Artists for Columbia Records in 1979 for her next album, Miss the Mississippi. She returned again to the pop Top 20 with that album's first single, "Half the Way" (number 15 pop, number 2 country, number 9 adult contemporary)  which became her last solo Top-20 pop hit. Gayle also appeared in the second episode of the fourth season of The Muppet Show. Gayle started the 1980s with another number 1 country hit, "It's Like We Never Said Goodbye" (number 63 pop, number 17 adult contemporary). This song led a historic Top 5 on the Billboard Country Singles chart on which the top five positions were all held by women. When her 1980 song "If You Ever Change Your Mind" was nominated for a Grammy award in the category Best Country Vocal Performance, the singer found herself competing in the same category with Sissy Spacek, who was nominated for title song from Coal Miner's Daughter (1980), the acclaimed biopic in which Spacek portrayed Gayle's sister Loretta Lynn. Anne Murray's "Could I Have This Dance" won the award. Gayle's next album, Hollywood, Tennessee, was her most blatant attempt at country crossover. The album's A-side, "Hollywood", was pop while the album's B-side, "Tennessee", was country. The album's three singles all reached the Country Top 10, but only the first single, "The Woman in Me", reached the Hot 100 (No. 76). Gayle's singles, however, frequently charted Top 20 on the AC chart throughout the 1980s. In 1982, Gayle worked on the Francis Ford Coppola film, One from the Heart, recording songs for the movie's soundtrack with Tom Waits. She then switched record labels again to Elektra Records. She recorded a duet, "You and I", with Elektra labelmate Eddie Rabbitt for his Radio Romance album. The duet quickly ascended to No. 1 on the Country charts, returned Gayle to the Pop Top 10 (No. 7) and became her biggest AC hit ever (No. 2). Her first Elektra album, True Love, surprisingly excluded this duet. It did produce three more No. 1 country hits — "'Til I Gain Control Again", "Our Love Is on the Faultline" (No. 23 AC) and "Baby, What About You" (No. 83 Pop, No. 9 AC). After Elektra Records was folded into Warner Bros. Records in 1983, Gayle released her next album, Cage the Songbird, which spawned two more No. 1 Country hits — "The Sound of Goodbye" and "Turning Away" — and two other Top 5 Country hits — "I Don't Wanna Lose Your Love" (No. 2) and "Me Against the Night" (number 4). "The Sound of Goodbye" became her final entry on the Hot 100 (No. 84) and Top 10 AC hit (No. 10) to date. In 1985, she released her next album, Nobody Wants to Be Alone, which contained two Top 5 Country hits – the title track (No. 3) and "A Long and Lasting Love" (No. 5). Later that year, she teamed with Gary Morris to record a duet for the soundtrack to the television series Dallas. The song, "Makin' Up for Lost Time (The Dallas Lovers' Song)", reached No. 1 Country, but became Gayle's last adult contemporary chart appearance (number 36) to date. Her 1986 album, Straight to the Heart, began promisingly with two more number 1 country singles — "Cry" (a remake of the Johnnie Ray classic) and the title track. However, these songs would become the last of Gayle's 18 No. 1 Country singles. She reunited with Gary Morris in 1987 to record the album, What If We Fall In Love, which would yield another theme from a television soap opera, Another World (number 4). Gayle guest-starred on the show as herself, a friend of the character Felicia Gallant, who was menaced by a serial killer known as the "Sin Stalker." Gayle and Morris performed the theme at the Daytime Emmy Awards and the song was used as the show's theme until March 1996. "Another World" became Gayle's last Top 10 country hit to date. As traditional country singers such as Randy Travis and the Judds began to dominate the country airwaves in the late 1980s, the success of crossover artists like Gayle began to wane. Gayle's final top 25 single was the title track from 1988's Nobody's Angel album (No. 22); her last charted single was 1990's "Never Ending Song of Love" (number 72). Gayle also sang the theme song for the short-lived 1983 television series Masquerade, the theme song having the same title as the series. Gayle released two more studio albums during the 1990s: Ain't Gonna Worry (1990) produced by Allen Reynolds and Three Good Reasons (1992). Both albums failed to chart and their singles all failed to reestablish Gayle at country radio, which by this point had abandoned older artists of all kinds. Gayle subsequently recorded several specialty projects. She released two gospel albums – Someday (1995) and He Is Beautiful (1997). In 1999, she released the tribute album, Crystal Gayle Sings the Heart and Soul of Hoagy Carmichael. Gayle released a children's album, In My Arms, in 2000. Her most recent studio album was the 2003 standards collection, All My Tomorrows. Gayle has since released two live albums, Crystal Gayle in Concert (2005) and Live! An Evening with Crystal Gayle (2007). In the early years of the new millennium, Gayle co-wrote and recorded "Midnight in the Desert", a haunting Southwestern song for late-night radio host Art Bell. Bell featured "Midnight in the Desert" as the closing theme song on both his Coast to Coast AM and Art Bell's Dark Matter radio programs. In January 2007, fugitive Christopher Daniel Gay escaped from custody at an Interstate 95 welcome center near Hardeeville, South Carolina, and made his way to Tennessee where he stole Gayle's tour bus. Gay drove the bus from Whites Creek, Tennessee, to the Daytona International Speedway in Daytona Beach, Florida, parking the bus in a VIP spot next to NASCAR Cup Series driver Jeff Gordon. Gay was arrested the following day and the bus was returned to Gayle. Gayle was ranked No. 33 in a 2002 CMT countdown of the 40 Greatest Women of Country Music. She was awarded "Best Female Entertainer" in 2007 by the Second Annual American Entertainment Magazine Reader's Choice Awards. In February 2008, she was inducted into the Kentucky Music Hall of Fame. On October 2, 2009, Gayle received a star on the Hollywood Walk of Fame during a ceremony in Hollywood, California. She continues to tour and performs 40 to 60 shows a year. In 2016, it was announced that Gayle would receive the Cliffie Stone pioneer award from the Academy of Country Music which is to be presented at a televised ceremony in August. On November 15, 2016 almost 50 years after making her debut as a guest artist, Crystal Gayle was asked to become a member of the Grand Ole Opry by Carrie Underwood. The two performed "Don't It Make My Brown Eyes Blue" before Underwood announced the invitation. Gayle was officially inducted by Loretta Lynn on January 21, 2017. Gayle is currently working on a new album, her first in 13 years. She states that the album will be covers of country music classics and will be produced by her son, Chris. Titled Am I That Easy To Forget, the project is set to be released in the early part of 2017. Best Female Country Vocal Performance (1978) – "Don't It Make My Brown Eyes Blue"
^ Herald-Journal, July 25, 1993. ^ a b Crystal Gayle at CMT.com biography. Retrieved January 24, 2007. ^ Russell, Steven. "The Last Outlaw (The Ballad of Christopher Gay)". Maxim August 2007. pp. 102–8. ^ Martin, Jeff (January 21, 2017). "Country star Crystal Gayle inducted in Grand Ole Opry". WCVB-TV. Retrieved January 22, 2017. ^ Christner, Ryan (December 7, 2016). "Career not slowing for indomitable Crystal Gayle". The Hutchinson News. Retrieved March 13, 2017. Flippo, Chet. (1998). "Crystal Gayle." In The Encyclopedia of Country Music. Paul Kingsbury, Ed. New York: Oxford University Press. pp. 156–7.